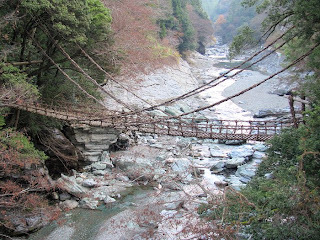 The suspension bridge of Kazurabashi (かずら橋) is one of the few remaining examples of vine bridges that once spanned the narrow Iya gorge. It's possible to walk across, but it's best to have a good head for heights. The planks forming the bridge's two meter wide deck are spaced about 6 inches apart so you can see right through to the river below. Made of woven vines (now actually reinforced with steel cables) the bridge is replaced every three years. Some people have called the often misty Iya Gorge area "Japan's Tibet."